Recently, the Cross Emergency Medical Clinic was blessed by the visit and work of Kelly, a retired surgeon from Hot Springs, Arkansas. Kelly grew up in Hobart, Oklahoma, where his father was a family practitioner. When Kelly was a teenager, Jerry Hilton, former pastor of the First Presbyterian Church of Midland, moved to Hobart and became pastor of the First Presbyterian Church there. It was during his time as pastor in Hobart that Jerry first wanted to start a youth ministry. Unfortunately, the town was small. There were only a few young people in his congregation, so he decided to form an interdemominational youth group. Kelly was a member of the Methodist church. When he joined Jerry’s youth group, the two men began a life-long friendship. Kelly now lives half of the year in Hot Springs and the other half in a small town in Colorado. Jerry and his wife Mary, usually spend August with him in his Colorado home. Kelly had been interested in doing some international medical work, but was was turned down by Doctors Without Borders because of his age. Jerry suggested that he contact Dr. Craig Daniels with Mercy Trips Healthcare Outreach. Dr. Daniels leads a medical team to Uganda each year. Jerry was certain that Dr. Daniels and his group would welcome Kelly. 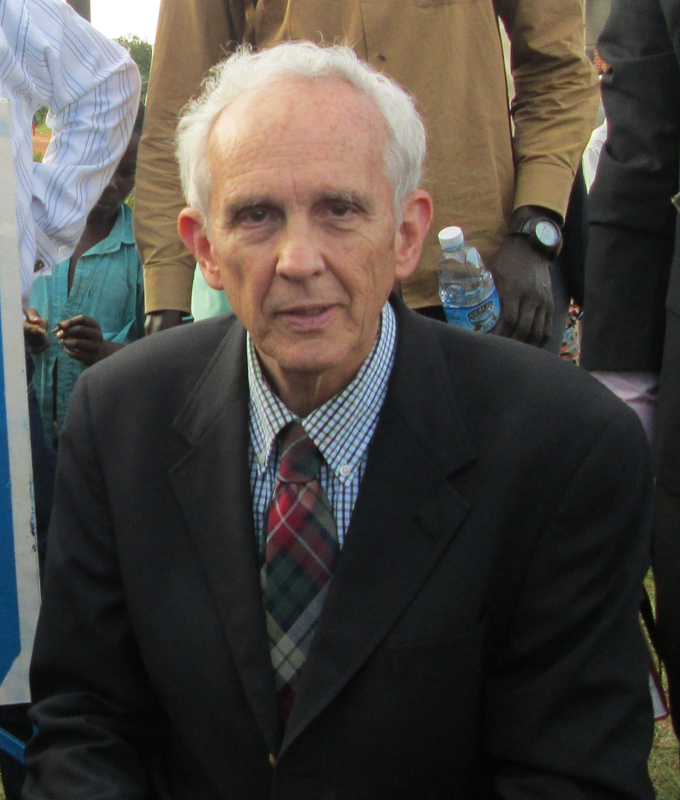 Kelly signed up to accompany Dr. Daniels in late July and August, but subsequently decided he’d like to be in Uganda earlier than initially scheduled. He arranged to arrive three weeks before the medical team and stay with me while working at the Cross Emergency Medical Clinic. Kelly is a very impressive and accomplished person. He took an eight month trip through North Africa, Jordan and Israel between college and medical school. He is well educated and has published several story books. Kelly is also quite an outdoorsman, who has fly-fished in Colorado and Alaska, backpacked in Montana and had jobs with the US Forest Service during his youth. Kelly graduated from Tulane University School of Medicine and received surgery training at Baylor University in Dallas. Before retiring about three years ago, he practiced general surgery in Hot Springs for over 30 years. Kelly is a traditional physician, relying more on physical examinations and patient history than technology. His many years of surgical practice have given him great surgical judgment. Kelly plowed right into the efforts here at the Cross Emergency Medical Clinic, working alongside Luke, the chief medical officer. Luke is interested in receiving additional surgical training and has assisted Kelly with the screening of many cases that are potentially eligible for surgery. Together, they developed a list of surgical candidates and presented it to Dr. Daniels’ team. Some of the conditions to be addressed in theses cases include large goiters, hernias, ovarian masses, lipomas, keloids, enlarged spleens, etc. Kelly has been a patient and caring mentor to Luke, teaching him about the surgical issues and principles involved in each case. Kelly worked very hard to set up the operating rooms at Kanginima Hospital, where the surgical team operates. These rooms had not been used for 14 months and were covered with dust. Mice, spiders and lizards were running through the rooms. Through Kelly’s efforts, water was connected, oxygen was obtained and all machinery was tested. Kelly was most enthusiastic about assisting the surgeons at the hospital. Regrettably, on July 26, he received a phone call informing him of his daughter’s death. He had to return quickly to the US to support his family and was unable to finish the work he had planned so carefully. Here at the clinic, we are all very sad that Kelly was unable to complete his mission. We know he loves Uganda, his medical team and the challenges of working with limited resources. We are very hopeful that he will return soon to do surgery; the need is very great. When Dr. Daniels’ team arrived a few days after Kelly’s departure, 15 out of 35 patients screened by Kelly were successfully treated with surgery. The remaining patients are awaiting his return.